Mega Man Battle Network 5, known as Battle Network Rockman EXE 5​ (バトルネットワーク ロックマンエグゼ5) in Japan, is a video game developed by Capcom for the Game Boy Advance (GBA) and Nintendo DS handheld game consoles. It it is the fifth game in the Mega Man Battle Network series, and the first Mega Man game to be released on the Nintendo DS. 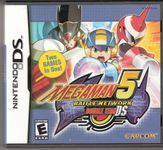 Battle Network 5 comes in three different versions: Mega Man Battle Network 5: Team Proto Man​ (ロックマンエグゼ5 チーム オブ ブルース Rockman EXE 5 Team of Blues) and Mega Man Battle Network 5: Team Colonel​ (ロックマンエグゼ5 チーム オブ カーネル Rockman EXE Team of Colonel), both for the Game Boy Advance, which have similar gameplay but slightly different supporting characters and stories, and Mega Man Battle Network 5: Double Team DS​ (ロックマンエグゼ5DS ツインリーダーズ Rockman EXE 5 DS Twin Leaders) for the Nintendo DS, which includes the content from both games as well as extra content. MegaMan battles viruses in Double Team DS. When Mega Man encounters viruses (or, later, hostile NetNavis), the screen shifts to a battle screen, set on a six by three square grid. On the left half of the grid is Mega Man, and on the other half are his opponents. Mega Man has a relatively weak arm cannon, the MegaBuster, but his main weapon is Lan's library of battle chips, one-use-per-battle special attacks which grant various abilities, including simple attacks, defensive effects, terrain transmogrification, or assistance from other Navis. Before battle, the player can construct a folder consisted of thirty battle chips, and each turn of a battle (measured by a timer bar at the top of the screen), the player is presented with a random selection of these chips. The player can send Mega Man up to five battle chips, after which the battle takes place in real time, with MegaMan, controlled by the player, attacking with his MegaBuster, dodging attacks, or activating battle chips from his queue. MegaMan uses his LongSwrd special ability in the second liberation mission in Team ProtoMan. Also new to Mega Man Battle Network 5 are Dark Chips, super-powerful chips. While they appeared randomly in Mega Man Battle Network 4 when Mega Man was badly damaged, they are much more like normal battle chips in this game, in that they can be added to the battle chip folder like any other chip. Their extra power comes with a price: every time Mega Man uses a Dark Chip, he loses one point from his maximum hit points, permanently. He can, however, use a Dark Chip for a Soul Unison; this is called a Chaos Unison, which is like a normal Soul Unison except that his MegaBuster is replaced with the effects of the Dark Chip he used for the Chaos Unison. While using this effect doesn't cause HP loss, it has to be done with careful timing, as charging with poor timing causes the Chaos Unison to end and an invincible, evil version of Mega Man to join the viruses and attack Mega Man for a short period of time using random battlechips. Source: Wikipedia, "Mega Man Battle Network 5", available under the CC-BY-SA License. A mysterious Navis force has taken control of the Internet!! Now it's up to Lan and his friends to infiltrate the Dark Chip Factory in the Nebula Headquarters and destroy the Dark Chip production system. The survival of cyberspace hangs in the balance! Two exciting versions - Team Protoman and Team Colonel! Experience separate storylines, different allies and enemies, and cool new battlechips.